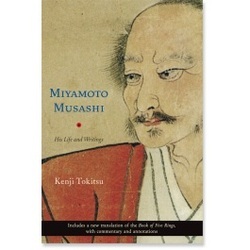 Those wishing to gain profound insight into the lore and facts embedded within the way of life of the legendary Japanese swordsman of the 1600s, a samurai known to many simply as Musashi, need look no further than author Kenji Tokitsu’s “ Miyamoto Musashi – His Life and Writings.” This book is one stellar slice of literature. Having heard numerous improbable tales of his prowess, the truth contained in this book is far more interesting. It’s a fine, entertaining read, difficult to put down. An exhaustive, yet dynamic work – fast moving, yet constructed to draw in both the pragmatic martial artist, as well as, the consummate research philosopher. This book sifts through an amazing amount of history and detail without becoming tedious. In a thorough biographic treatment, the reader is presented with most, if not all, of the available factual information about Musashi. Public records and martial arts school histories provide a penetrating look into this legendary master samurai warrior and his art. The work covers his childhood, family and martial arts ties and many details of the master’s life not generally known. Eyewitness accounts of his duels and battles are in this book. Who taught Musashi and what he taught during his lifetime are thoroughly covered – his artwork is also on display. The current state of his teachings and who teaches them today are included in the text. Contained herein is also an excellent translation of “The Book of Five Rings.” Most serious martial artists will buy the book just for this alone. Rarely does one see such a scholarly work on the martial arts. Born in Japan, Tokitsu Sensei has studied martial arts since he was a child and founded the Tokitsu-ryūAcademy in 2001. He also holds doctoral degrees in sociology and in Japanese language and civilization. The book is very well organized and the translations are graceful and as contextually accurate and relevant as the author’s notes and commentary can reveal. The meticulous attention given to research makes this work a real standout. Once purchased, this book will earn a permanent place on your bookshelf. Copyright ©2013 by Chris M. Suboreau, George M. Yore & The Visayan Eskrima Guild, All Rights Reserved.